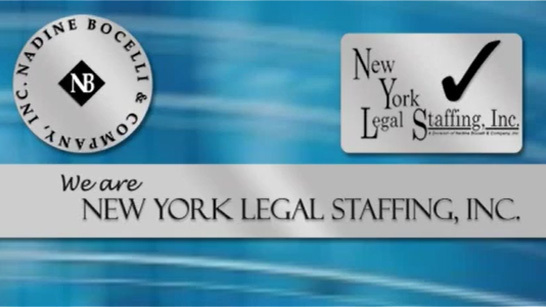 Client Reviews – Nadine Bocelli & Company, Inc. – New York Legal Staffing, Inc.
Nadine Bocelli & Company, Inc. – New York Legal Staffing, Inc. provide the highest level of service and support for our clients in the legal community. We strive to meet or exceed the requirements and expectations of our clients when finding them the perfect employees for their available opportunities. Our experience and recruitment policies and procedures allow us to identify the appropriate candidate quickly so our clients spend less time searching. We focus on finding you the right candidate at the right time. We constantly receive emails from our New York and tri-state clients expressing their appreciation for the level of service we provide. We would like to share some of these with you. “Our office has used Nadine Bocelli & Company, Inc. to fill open positions for several years. The entire staff is professional, attentive and a pleasure to work with. The candidates they provide, sometimes at a moment’s notice, are top quality. I recommend this agency without any reservations.” ~A.R. “I have always found the counselors at Nadine Bocelli to be professional and responsive when working on my firm’s employment needs. I view them as a valuable resource in getting my job done.” ~T.S. “Nadine Bocelli is wonderful to work with. She is very pleasant, returns calls quickly and presents quality candidates.” ~N.G. “I would say that the two of the best compliments I can give are that many of our legal secretaries were placed by you and that the candidates themselves have told me that you really listen to them; they feel as if they are not being treated like a “piece of meat” and then they are sent out on interviews that are appropriate to their backgrounds which I rarely hear about employment agencies.” ~T.B. “I’ve known Nadine Bocelli for many years, having been both her candidate and client. She listens to what you need and then does her absolute best to deliver quality service in a refreshingly honest, trustworthy manner. She’s always my first stop when I need to hire on any level.” ~C.L. “Having worked with Nadine Bocelli for over a decade, I can attest to her professionalism. Her keen perceptiveness to match quality candidates with any openings a firm may have, is extremely valuable to all administrators.” ~B.N. “Nadine Bocelli & Company, Inc. continually provides us with quality candidates who possess the proper skills for the position we are filling. The staff at Nadine Bocelli & Company, Inc. understands our needs and our firm atmosphere. I have hired many candidates and most are still here, even after 3-4 years. Nadine Bocelli & Company, Inc. uses the latest technology to e-mail resumes to me which saves me a great deal of time. I use Nadine Bocelli & Company, Inc. for all my hiring needs.” ~F.M. “Nadine Bocelli & Company, Inc. has been very helpful in providing us with quality candidates who possess various skill sets, backgrounds and level of experience. We have been pleased with the level of professionalism extended to us not only by Nadine but her entire staff. We have used Nadine Bocelli & Company for the last several years and plan to continue to do so.” ~C.G. “I have used Nadine Bocelli & Co. to fill full-time positions for many, many years. Nadine takes the time to listen to my needs and only sends me the applicants that best fill my requirements. Her candidates are usually very professional and poised. I have been greatly satisfied with the service and have always recommended the company to my colleagues.” ~L.S.